By the mid 20th century Glasgow was home to a growing non-heterosexual population, and wherever such groups exist there are platforms for social engagement. When I interviewed 2 dozen gay and bisexual men in the mid 2000s, stories emerged which detailed the history and development of the queer scene in Glasgow. I have already produced a map which details many of the venues which catered, publicly or privately, for the city’s non-heterosexual population, but in this blog post I want to flesh out beyond the structural history and engage with the emotional and social history of the queer scene in the city. I was in about 19 maybe 20 and I had overheard a conversation with my father and they were speaking about a local celebrity and my father’s colleague had told him about this celebrity being a ‘nancy-boy’ and he also told where this celebrity drank. So, I made up my mind then that I would need to get to this pub to get to know him, this celebrity, because then I would be on equal terms, I would be in a pub on chatting terms and maybe he would put me wise to things. It wasn’t a notorious gay pub, it was a classy pub and lounge bar and cocktail bar, and that’s where I went. It was the ‘Top Spot Mexicana Bar’ at the top of Hope Street. 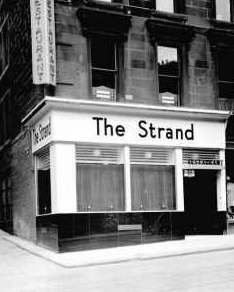 Stephen – When I first went in to ‘The Strand’ bar I didn’t realise …that you got ‘names’….you were either given a name or you were to pick a film star that you admired a lot, female, and they gave you that name. I had picked a film star who I looked nothing like but I did admire and they said ‘you don’t look nothing like her; you’ll need to pick somebody else’. I picked another film star and they thought this was ideal and I got her name. Say a lad of 19 or 20, blond hair, came into the bar and he was nice and pretty and polite, they would probably have called him ‘Doris Day’. Whereas, if another lad came in who wasn’t blessed with the best of looks but kept himself as well as he could and was always rather acid when he was speaking to anyone, he would probably been called ‘Bette Davis’. While Stephen indicated that being able to socialise with other non-heterosexual men gave him ‘confidence’, ‘reassurance’ and ‘psychological comfort’ there was always risk attached to meeting men in bars, even in gay bars. In these days don’t forget, it was also very dangerous because you got people who were called ‘queer bashers’. So they would pretend [to be gay] until they got the guy up a lane or something and they would [beat him up]. Well, you know, some of them were very attractive people but they were a bit rough. Now, let’s define what we mean by rough here, there is nothing nicer than a bit of ‘rough trade’ but they weren’t. As my late elderly gay friend would say, ‘Not quite in our garden’. I didn’t feel I had anything in common with them and then of course I met one or two pivotal people who introduced me to some very interesting, well-connected people. There does appear to have been an element of a ‘clash of cultures’ on the Glasgow scene, which was largely the result of class differences. Alastair – A lovely story about a gentleman in Edinburgh: he and his friend had picked up a long-distance lorry driver who was drop dead gorgeous and he brought him to a dinner party and he wouldn’t eat anything. Our host eventually opened a tin of Heinz Tomato Soup and threw a few croutons in and he wouldn’t eat it because of the croutons and the line of the evening was, ‘I’m a mince and tatties man myself’. So, predominantly I would go to these parties and there was a group of people round the city who almost every Saturday night would have a party. [They were] like-minded, probably slightly more effete men would go to them. Another of my interviewees viewed the social diversity of the queer scene in Glasgow as something of great importance; where economic and social divisions were overcome through a shared sense of belonging. Brian (b. 1936) –I went to a gay bar from time to time in town…it was in West Nile Street, it was at the back of a restaurant called The Royal. I remember going to this gay bar in The Royal when by that time I was a local celebrity and [I met] two boys who were an item…one was a joiner from Partick who told me wonderful stories about his early years in Partick, about wandering up Byres Road on a Sunday, and it was deserted – because there was nothing in those days – looking for a pick-up. He knew he’d find it in Botanic Gardens. He came from a working-class family living in Partick probably in one of the tenements just along Dumbarton Road. His mate was a boy who had come up from Ayrshire to work in one of the big stores in Glasgow as a window-dresser or something like that, and whose family had thrown him out when they had discovered that he was gay. The extraordinary thing was that the joiner’s family, who as I say were perfectly ordinary working-class family living on the Pollok estate, had taken him in knowing what the situation was between the two of them. I think one of the things about homosexuality is that it is probably one of the most democratic things…it is a sub-section of society that was probably ahead of its time in terms of the way that the social classes mixed, partly because we were all, if you like, aliens together so whether you came from a working-class background or whether you came from [another] it didn’t matter. As they gay scene developed in Glasgow during the 1970s and into the 1980s, it took on a political edge, and offered a level of support and socialisation. For Chris (b. 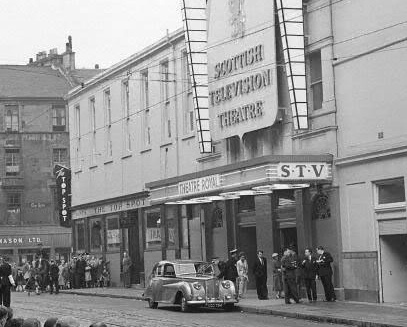 1958) his initial visits to Glasgow’s scene offered more than simple entertainment. It was really exciting, I think that’s the only word I can really describe it as, it was really different, really, really exciting and it wasn’t like anything else you could experience outside the gay scene and probably the gay scene today but I think as a young man today just coming out and feeling okay in his own skin it felt as if all the shackles had just disintegrated. What is interesting about these recollections is the diversity of experience. The queer scene in Glasgow during the 1950s & 1960s was governed by discretion. Some interviewees spoke of the democracy of the scene, whilst others noted some elements of division. In the 1970s and 1980s a more confident and identifiable scene emerged, but it still contained something like a paternalistic concern for individual and group welfare. This is not to say that the contemporary queer scene lacks any of these features; individual responses and interactions still govern, to some extent, individual experiences. I’m always interested in hearing more experiences of Scotland’s ‘queer scene’, from the 1940s through to the 1990s. You’ll find my email address here. Reblogged this on The Halfhearted Homonym.